All revised videos and written commentaries due by noon! October 18 – How to Make a Video Essay? Export PechaKucha videos to Classes folder. 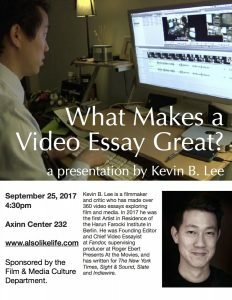 Reminder: Kevin B. Lee will be visiting on Sept 25, with a public presentation at 4:30pm in Axinn 232. If you do not have experience with Adobe Premiere, start working on the Lynda.com tutorials to help learn the platform.